Contractor: DeMaria Building Co., Inc. Opened in 1928, the Detroit Zoo is the largest paid family attraction in Michigan with more than 1.3 million visitors annually. It’s home to more than 2,500 animals of 280 species, and situated on 125 acres with many naturalistic habitats. 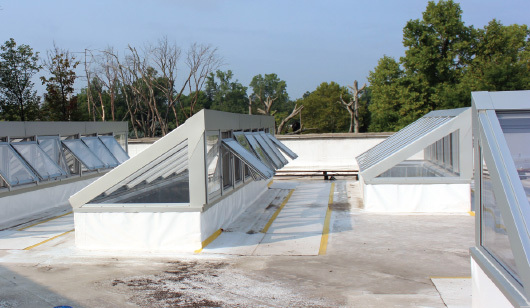 The Detroit Zoo’s Great Ape exhibit had a series of old dome skylights in dire need of replacement. Apes are highly sociable animals that thrive in natural daylight similar to their human counterparts. The old skylights did not let in sufficient natural daylight necessary for the well-being of the Great Apes. 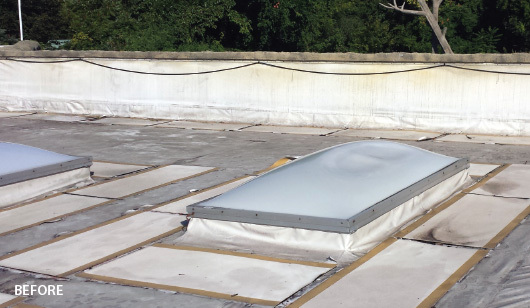 Thermal efficiency was also a major requirement in the new skylight system. All work had to be conducted during the zoo’s regular hours of operation, and working times could change due to animal issues. 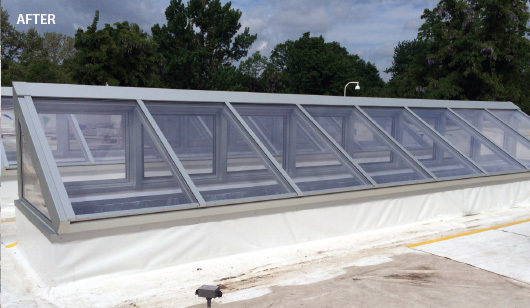 Wasco’s Pinnacle 350 Lean-To was chosen for its large span capability, variable-pitch hinge design, and fast on-site assembly and installation. Primates are very curious so visual barriers were placed so the animals could only see portions of the work area. The old domes were removed, and new openings were cut in the pre-cast concrete roof. 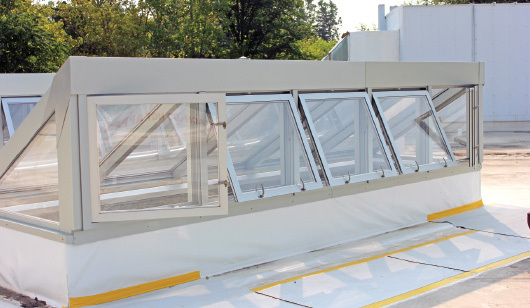 The new skylights were installed with awning type vents and casement windows so that food could be broadcasted to the animals through the roof openings. 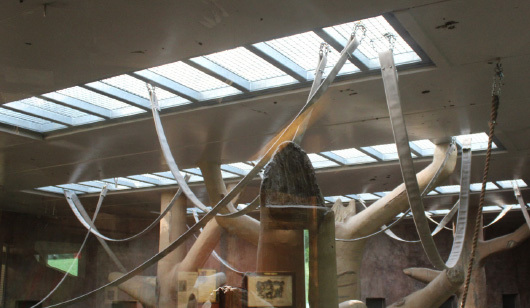 The glazing is Lucite “Utran” UV Transmitting Acrylic which allows the UV to enter the space, to create a healthier atmosphere for the primates. “Wasco’s representative, Randy Sitzler from Abbott K. Schlain Co., was very knowledgeable and easy to work with. Thanks to everyone for their efforts and most of all for the excellent communication that was necessary to facilitate and complete this project in a short period of time to minimize the impact on the animals. Again, thank you all for a job well done,” said Mike Draper, Senior Project Manager, DeMaria Building Co., Inc.
We have been working hard for 44 years to make our family-owned business a leader in the construction industry. DeMaria is in the business of building relationships with clients, partners, and employees. Our methods are rooted in teamwork and collaboration. We believe that the ultimate key to our corporate success is the advancement of talented employees. With 81% repeat business, our 44-year-old building company is dedicated to exceeding customer expectations. Crain’s Detroit Business ranked DeMaria as #12 on their Largest General Contractor list in 2013. We have also been honored for 11 years as one of Detroit’s 101 Best and Brightest businesses to work for. 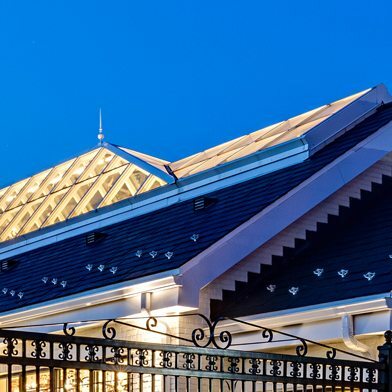 DeMaria has been utilizing elements of sustainable design and energy conservation in our work since 1976, but green initiatives became paramount in the construction industry in the twenty-first century. We joined the US Green Building Council and have completed several LEED-certified or LEED-registered projects. Awning type vents and casement windows enabled the food to be broadcast to the animals through the roof openings.